Just as Smitty expected, their destination was quickly coming up over the horizon. The fleeting glimpse of solid land, Milne Bay, New Guinea was only a short stopover for water (such a disappointment) and they continued their cruise north. 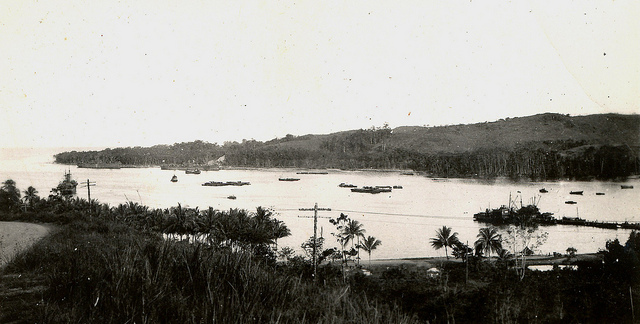 The 11th came upon the humming waterfront of ships manipulating to unload troops, supplies and equipment in Oro Bay. They witnessed a paradoxal view of organized chaos. Down the rope ladders they went to the beach taxis, DUKWs (2 ton amphibious vehicles commonly called “ducks”) and onward to the awaiting shoreline. At latitude 8*52’60S and longitude 148*30’0E would be the first step for many a G.I. on foreign soil. On the beach, the heat seemed to slam into the troopers and their uniforms became soaked within minutes, but they proceeded on to the Buna-Dobodura area to make their new base camp. Although General Swing had contracted malaria and was hospitalized when his men sipped out of the U.S., he boarded a plane for Brisbane, Australia to attend a meeting with Gen. MacArthur. Swing was briefed on the immediate plans for his command and was reminded that the 11th A/B was considered a “secret weapon.” Swing managed to be in Dobodura in time to meet his men as they disembarked. PERSONAL NOTE – If any photo image is too small to see, click on that image to enlarge. In future letters you will see the dry humor my father had. I can’t wait to get to those. 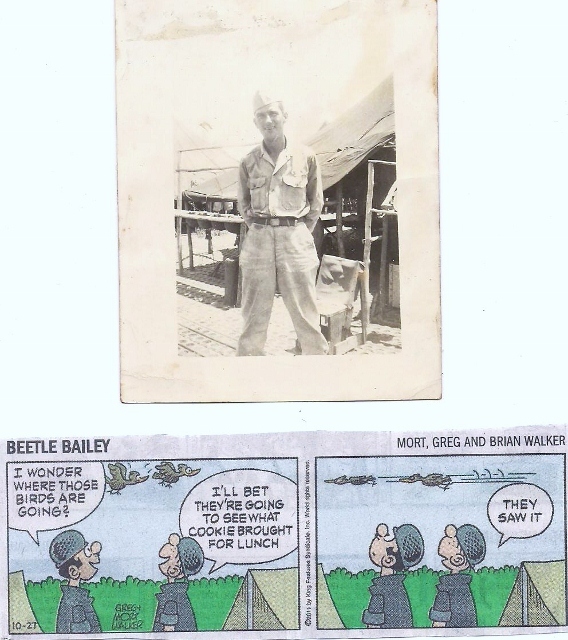 Posted on October 19, 2012, in Letters home, SMITTY, Uncategorized, WWII and tagged 11th airborne, Broad Channel, Gen. Swing, History, New Guinea, Oro Bay, Pacific War, paratroopers, WWII. Bookmark the permalink. 9 Comments. You can feel the love there between your father and your grandmother. Enjoying these early posts. Thanks. They were very close, due to her father’s disappearance and her mother getting ill, the Great Depression – they had to be close to survive. They were made of great stock. They somehow knew how to survive amidst all the hardships. My maternal grandmother did the same thing. Single mother with 9 kids. Nowadays, people will just fall apart or turn to drugs. If I have to – I’ll start all over – this is really annoying me. The letter is a wonderful look into the past, filled with emotion, and insightful as to Everett’s relationship with his mother. Very close to his mother, but she deserved it. It was as though love gushed out of her. Some of the fondest memories of my life were of my grandmother. I relate…some of my fondest memories are of my grandmothers.